We are very excited to plan for our 13th end of year show! 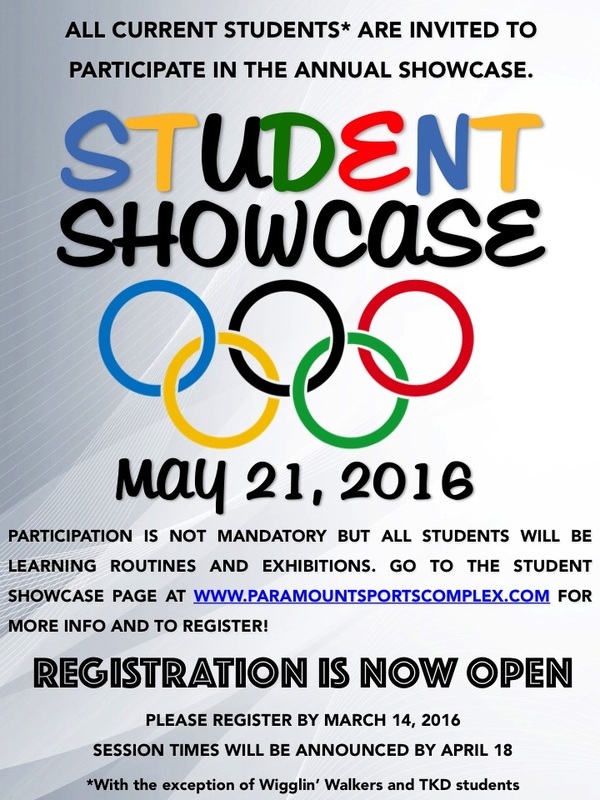 The Student Showcase is open to all our current students, excluding Wigglin' Walkers and TaeKwon Do students. Wigglin' Walkers will have their own show during class time and Mr. Louie will be arranging his own end of year event. The showcase will be run like a gymnastics meet with sessions throughout the day. Please read on for details of this years showcase! •Sign up through your online account to participate. You can sign up after January 2nd. The last date to sign up will be March 14th. Payment must be made within 48 hours of registration. No refunds will be given after March 14th. •All students will be learning routines and exhibitions in class but participation in the showcase is not mandatory. •There is a cost to participate. All students will receive either a leo, boys dri fit-shirt or cheer tank to wear at the event and keep. •All students will be sized for a leo or shirt during their class time February 15th – 26th. •Session times will be determined by April 18th. Four spectators per performer will be admitted and extra spectators will be charged $5. •The show will be recorded by Vince Allen Memory Lane Inc. This year you will be able to purchase a leo, shirt or tank even if you are not participating. The leo will cost $30 and shirts $25 for students not participating. Orders must be placed by March 14th. No refunds after this date.